They were born Nov. 7th. 2018. Family raised, Parents on site. Great Hunters, Field trail Champions in the background. 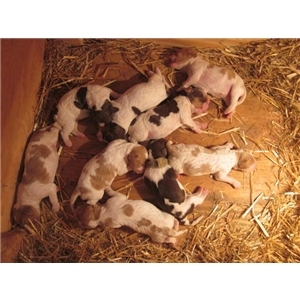 Close working hunting dogs, and natural retrievers. Orange and white, Liver and white, and some Tri-colors. Health Guarantee, Reference also available. Very well bred sire, Multiple FC, DC, AFC in his pedigree including FC AFC Rimardas Trademark, NFC DC AFC Tequilas Joker, NFC DC AFC Gamblers Ace in the hole, FC Misfits Radikewell Krista JH, FC AFC Rimardas Mollys a Dan D JH, FC Tequila Dynamite, NFC Rimardas Gambler, and many more!